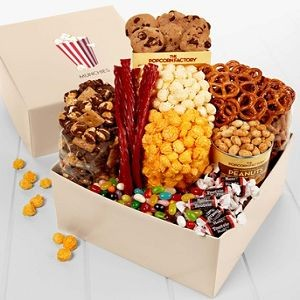 Our simple and sturdy Munchies Box comes fully loaded with three flavors of our premium Gourmet Popcorn (Cheese White Cheddar and Cocoa S'Mores corn) Dry Roast Peanuts Chocolate Chip Cookies Mini Pretzels Red Licorice Twists Jelly Belly? Jellybeans and Tootsie Roll? Midgees.